Any student who is enrolled and using the Better Practice app to track their practice can choose one or multiple “events” to compete in. Winners in each event category receive medals, and one determined practice champion will have their pick of several amazing and unique prizes. The competition begins October 1 and ends at Midnight on November 1. There are three main categories of events that any student may participate in at any level (see below for details). 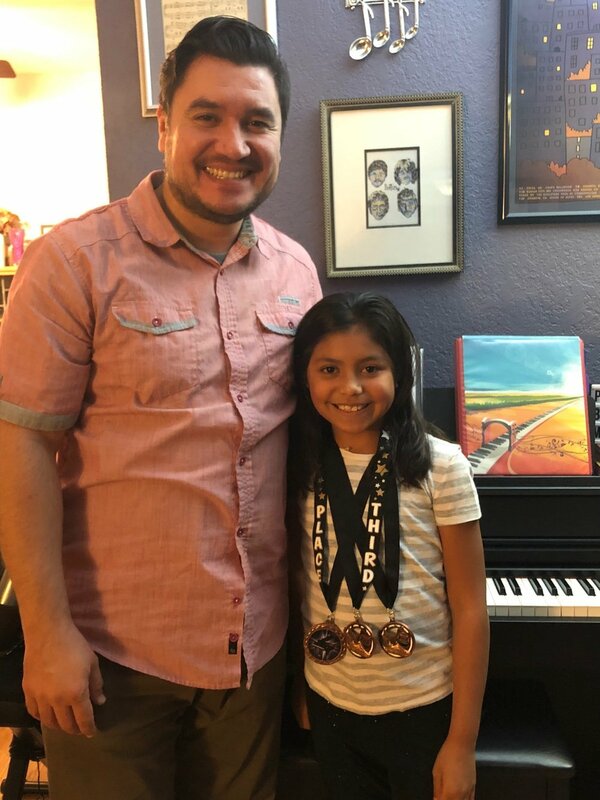 In addition, I’ve included a Chord Challenge for students in the Accompaniment Program, and an Ultimate Practice Championship for students wishing to compete in multiple categories simultaneously. All students must use the Better Practice app to record their practice time in order to receive credit for their chosen event(s). In some cases, I may ask students to provide additional proof that they completed the event or challenge - such as playing a specific song or otherwise demonstrating that they logged their practice accurately and fairly. Students should begin the competition by deciding ahead of time which event or challenge they’d like to focus on. Then, share your decision with me during your lesson (or by messaging me). This will allow me an opportunity to explain the rules in detail, and help you get started. Better Practice tracks the amount of time spent using the app each session. In addition, various other details are kept on record, such as the number of different songs/items practiced, and how each practice was graded by the student/parent. All of these details can be seen in the Practice Summary on the “Insights” page. Most time practiced overall - A Gold, Silver, and Bronze Medal will be awarded for the 1st, 2nd, and 3rd cumulative monthly minutes practiced. Most number of items practiced - A Gold, Silver, and Bronze Medal will be awarded for the 1st, 2nd, and 3rd cumulative number of items practiced. GOLD STREAK - Practice the entire month without missing a day (each day must be at least 15 minutes). SILVER STREAK - Practice 5 consecutive days in a row at least 4 times within the month. BRONZE STREAK - Practice 5 consecutive days in a row at least 3 times within the month. 1,000-MINUTE DASH - A Gold, Silver, and Bronze Medal will be awarded for the 1st, 2nd, and 3rd students to complete 1,000 minutes (or more) of practice within the entire month. 500-MINUTE DASH - A Gold, Silver, and Bronze Medal will be awarded for the 1st, 2nd, and 3rd students to complete at least 500 minutes of practice within the entire month. 100-MINUTE DASH - A Gold, Silver, and Bronze Medal will be awarded for the 1st, 2nd, and 3rd students to complete at least 100 minutes of practice within the entire month. For students who have begun the Accompaniment program, using the Chord Game in Better Practice to improve their skills should already be a part of their daily practice. If you’ve managed to continuously beat your high score at home, then step up your game to the next level, and take the challenge at your next lesson! Results will be recorded into the official Studio Records, and the students with the fastest times in the following challenges will be crowned winners. GOLD CHORD CHALLENGE - Complete the chord game with both hands (BH) for all known chords (whichever ones you know), including sharps and flats. SILVER CHORD CHALLENGE - Complete the chord game with both hands for Maj, Min, and Sus chords, including sharps and flats. BRONZE CHORD CHALLENGE - Complete the chord game with both hands for all shapes (Straight, Triangle, Curve), including sharps and flats. Are you a Piano Practice Champion? Do you have what it takes to get the Grand Prize? Compete and place Gold, Silver, or Bronze in ALL of the above events (Chord Challenge not required). If more than one student qualifies for this prize, the each student’s AVERAGE minutes per day will be used to determine the winner. Every event category has Gold, Silver, and Bronze awards. Students will be awarded an actual medal based on their placement in the competition. 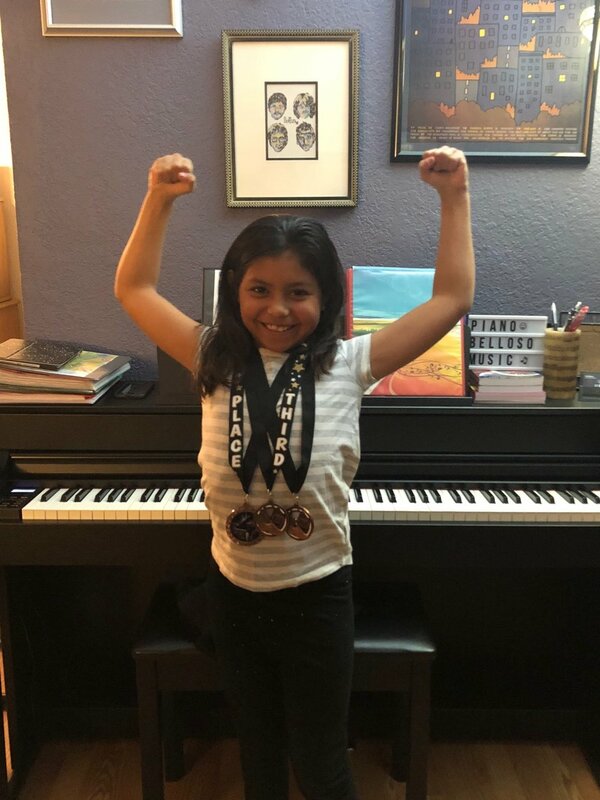 If a student competes in multiple categories, they have a possibility of receiving multiple medals, and may also qualify for the Ultimate Practice Championship. For this special category, a different medal will be awarded, along with the Grand Prize. I have over 30 hand-picked musical t-shirts to choose from. The winner may choose their favorite. Sizing and color is customizable for most of the shirts. $20 Gift Card to the streaming music service of your choice. In most cases that means two free months of a subscription, or 20 song downloads! Possibilities include iTunes, Spotify, YouTube, Amazon, and Pandora. No Bronze Medal awarded in this event.